Selected by Scott Secco - Brandon Semenuk and Rupert Walker have teamed up for a new movie called Revel In The Chaos. This is one of the those situations where a strong concept will give you a great shot wherever you shoot from. 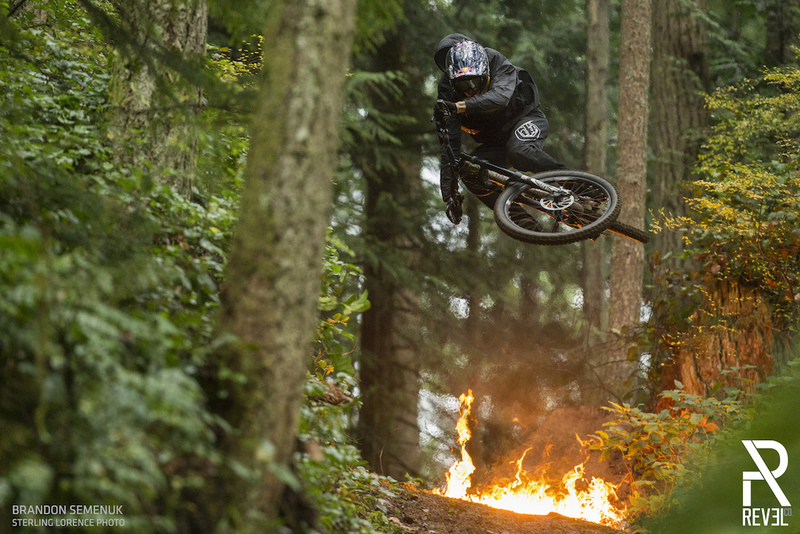 That being said, I think this angle really emphasizes the flames, as Semenuk is close enough that they're lighting the bottom side of his bike and body. Sterling captured another classic nug here, and If this image is anything to go by, then the movie will be awesome. uhh whats happened to the picture sizes ? when I click XL I still get the same sized image ? Brandon is my biggest inspiration. What is the key to keep the bike that low? Now that makes a great wallpaper! Its like NBA jam for SNES. HE'S ON FIRE! That's actually an optical phenomenon known as refraction, occurring due to the air density changes from the heat of the fire. Reckon it would look better without the fire. Cool photo either way though.